Offering the finest of cabin accommodations and educational adventures into Kluane National Park. 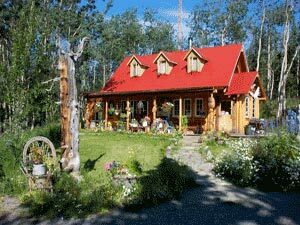 The Cabin is an idyllic ecolodge in a wooded setting near Kluane National Park’s Kathleen Lake. Five unique guest cabins are equipped with propane heat and lights and include a two burner stovetop, cooking utensils and portable water. Centrally located hot showers, flush toilets, campfire circle, barbeques and picnic area are offered. Rest and relax at “The Cabin”, an ideal recreational base from which to explore Kluane National Park and Reserve. Explore and discover Kluane National Park and Reserve with a professional naturalist and Heritage Interpreter. Customized day hikes for individual or small groups. Expert interpretation of Kluane’s natural and cultural history.